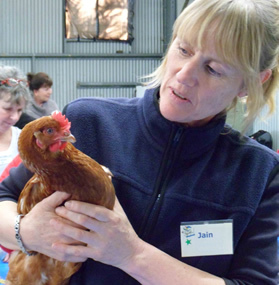 If you would like to improve your horse training skills, then I recommend you train a chicken! I recently heard that one of America’s top animal trainers, Bob Bailey, believes that “when you can train a chicken you can train just about anything“. So I headed off to a ‘Chicken Training Camp’ with Terry Ryan. The workshop bought together a group of dog and horse trainers wanting to improve their training skills. The importance of breaking a ‘trick’ into small parts. I was training the chicken to peck a red disk. I couldn’t just put her on the table and expect her to wander over to the correct disk and peck it. There were many steps involved: She needed to be comfortable being picked up. She had to be happy to be placed on a table without wanting to run away. She then had to walk near the disk. Then peck near it. Then actually peck it. She then had to learn that if she pecked a differently coloured disk that she didn’t get a reward. If I made the steps too big she would become confused and sometimes I needed to go back a step. If however, I made the steps very small and easy for her to work out then she learnt a lot quicker. The importance of timing. We used a mechanical clicker to ‘mark’ when the chicken did the right thing. She was then given a food reward. With horse trick training I use a sound (I click my tongue) to let my horses know they have got it right (but you can also use a word). The marker must be given at the EXACT moment that the animal does the behaviour we have asked for. If it is given even a split second after the behaviour then we are marking something that we might not want. For example I was training my chicken to peck a red disk. If my timing was a bit slow I might click when her head was coming up from the disk. I would then be rewarding her for lifting her head. Timing and breaking your tricks into small parts are very important to help your horse learn as fast as possible. If you get a chance to attend a chicken training camp I highly recommend you go along. You will have lots of fun and it will really improve your training skills. PS. Watch closely toward the end of the video where Bonnie works out that she doesn’t get a reward for pecking the blue disk only the red one. Clever chook! !